One California sea lion was trapped and euthanized at the lower Columbia River's Bonneville Dam Tuesday as Oregon Department of Fish and Wildlife resumed efforts to remove marine mammals that states say are hindering efforts to restore threatened salmon and steelhead stocks protected under the Endangered Species Act. A physical examination by ODFW veterinarians showed the presence of precancerous lesions that made the animal ineligible for transfer to a zoo. According to ODFW, veterinarians estimate California sea lions with this condition have very short life-spans -- about 1.5 years. The Queens Zoo in New York has offered to take up to two healthy California sea lions captured as part of the springtime removal program in the Columbia River. Through 2012, wildlife managers have removed a total of 54 California sea lions -- 11 of which were sent to zoos and aquaria that met the federal criteria for placement. 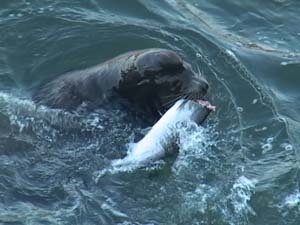 In March 2008, fish and wildlife agencies in Washington, Oregon and Idaho received federal authorization to remove California sea lions that have been observed preying on salmon and steelhead below Bonneville Dam, which is located nearly 50 miles upstream of Portland and 146 miles from the river mouth at the Pacific Ocean. The federal authorization under Section 120 of the Marine Mammal Protection Act allows wildlife managers to use lethal measures to remove sea lions that meet specific criteria, although the states' first priority has been to relocate them to zoos and aquariums. have been subjected to but not responded to non-lethal hazing. The authorization, which was reissued by NOAA Fisheries Service last year, allows removals through June 1, 2016. So far this year California sea lions presence remains at relatively low levels, according to the most recent weekly report produced by the U.S. Army Corps of Engineers research team that heads monitoring of sea lion activities at the dam. The research was started initially as an attempt to assess the feeding behavior of, primarily, California sea lions that had begun near the turn of the century to show up in springtime in greater numbers than they were known to historically. That congregation assembles at a time when the upriver spring chinook salmon run surges up the river. While that phenomenon is still observed carefully and catalogued, the behavior of the Steller sea lion population in the lower river is also drawing the attention of the Corps researchers, and state and tribal fish managers. The number of Stellers -- a species that is also ESA listed -- visiting the dam in springtime has increased greatly in recent years. And so has their take of white sturgeon, a native species much prized by tribal and non-Indian fishers. During 2005, researchers noted the take of only a single sturgeon during 1,108 hours of observations at the dam. But that number has grown steadily, first into the hundreds during the next four years, then to an observed take of more than a thousand annually in 2010 through 2012. The so called "adjusted" sturgeon consumption total in 2011 was a record 3,003 and was estimated at 2,498 last year. The adjusted total estimates the number of sturgeon taken during unobserved hours and also adds in a share of witnessed take of fish of undetermined species. The Steller sea lions have been responsible for nearly all of the white sturgeon take below Bonneville with the California sea lions concentrating mostly on salmon and steelhead and other smaller fish species. Most of the sturgeon taken are in the 2-4-foot range, though larger adult fish have also been targets. In 2012, the observed sturgeon take through April 20 was 1,336. This year the white sturgeon take through April 17 was 309, all taken by Steller sea lions. "Sturgeon catch is the lowest rate since 2007" the weekly research report said of observed predation this. "Steller sea lion numbers are the same as for the past two years at this point," the April 18 report says. "The maximum number of SSL seen any day so far this year was 28. We have documented approximately 60 different SSL's visiting the dam so far (including 29 with brands). All but 14 SSL are confirmed as seen in past years, although these figures are preliminary." "They're out there hunting," Corps researcher Bjorn van der Leeuw said of the Stellers, but apparently without as much luck as they've had in recent years. "The sturgeon just aren't there," van der Leeuw said of various locations near the dam and just downstream that have been known to host large aggregations of white sturgeon during the winter in recent years, making themselves relatively easy prey for the big Stellers. For some reason the sturgeon seem to have canceled the convention, or decided to hold it elsewhere. "We have various theories," about the suddenly reduced take of white sturgeon below the dam, said Olaf Langness, a Washington Department of Fish and Wildlife researcher. Late last month, collections of predators such as sea lions were spotted in areas downstream, supposedly feeding on a pulse of eulachon -- called smelt -- that had returned to the river system to spawn. While estimates of the smelt run size are still forthcoming, by most accounts there were "significant numbers, at the least," Langness said. The little fish may have been a draw for the sturgeon as well. "They're a good food source," Michael Parsley of the U.S. Geological Survey said of the smelt, which had been returning in such low numbers in recent years that were ESA listed. And there "might be other things going on" in the river that caused the sturgeon to disburse, Parsley said, or even hang together near the dam at depths were they are not detected by the sea lions. "We've seen these off-channel winter aggregations" at various sites up and down the river in the past, said the Oregon Department of Fish and Wildlife's Tucker Jones. Some level of predation is happening, though maybe not so much in plain sight as has been the case at Bonneville. California sea lions have had a modest presence at the dam thus far this year. "California sea lion numbers this year are lower than we have ever observed, however many new individuals showed up this past week," according to the April 18 report. "The maximum number of CSL seen on any one day so far this year is 12. We've identified about 24 so far, seven being repeat individuals from previous years." Last year only 39 individual California sea lions were spotted at the dam over the course of the observation season, which begins anew with each New Year but intensifies during the March-May period. The lowest number of California sea lions charted since the research began in 2002 was 30 individuals that first year. Next low had been 54 in 2011 and in 2009. The peak count was 104 individual California sea lions in 2003. "It's been building," Robert Stansell, who heads the Corps research project, said of California sea lion presence. Likewise, more salmon are starting to show up at the dam on their spawning journey. Dam passage numbers hit a peak in late April or early May. The California sea lion dynamics seem to have changed somewhat from most of the earlier years of the study, as least so far this year. Instead of older animals that have visited the dam year after year, observers are seeing mostly younger, first time visitors that explore and then move on. "We see groups of five or six of these young, sleek guys just darting around" the base of the dam and then apparently heading back downriver, Stansell said. There is no shortage of California sea lions nearby. ODFW reported a record 627 counted in the east mooring basin at Astoria, Ore., on April 9, which is about double the previous record. Astoria is near the mouth of the river. But predation on salmon and steelhead observed below Bonneville so far has been low, due to some degree that early season fish numbers were low. "Predation by SSL (primarily) and CSL on salmonids has increased, but still lags behind any previous year observed. Total salmonid catch through April 17 (355 expanded by interpolating for weekends) is the lowest we have ever documented. Of the total salmonid catch observed through April 17, all but 15 are attributed to the Stellers. The salmonid population of greatest concern to fish managers is the Upper Columbia spring chinook run, which is listed as endangered under the ESA. Endangered status means the species is believed at high risk of extinction. Snake River spring/summer chinook, listed as threatened under the ESA, are also vulnerable to predation as they mill around below the dam in search of a passage route. Other ESA-listed salmon and steelhead spawning populations headed up the lower Columbia River in the spring include Lower Columbia River chinook, Lower Columbia River steelhead, Middle Columbia River steelhead, Snake River Basin steelhead, Upper Willamette River chinook and Upper Willamette River steelhead.